It seems that robots are the major force propelling contemporary society into the future. To be more accurate, it is the hybridization and integration of electrical engineering, mechanical engineering, robotics, and computer science that is rapidly transforming the world we live in. 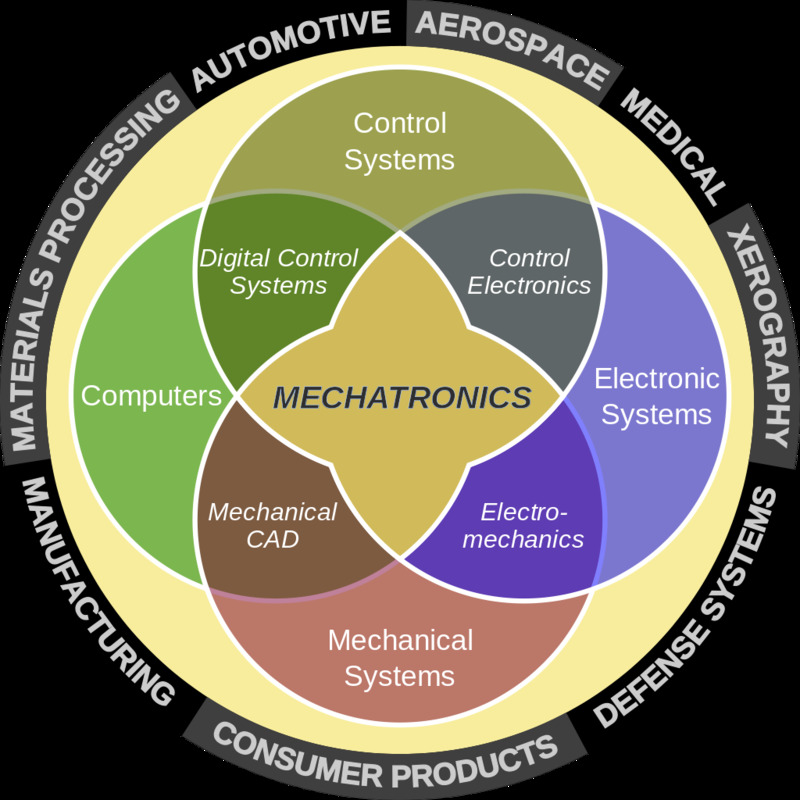 The amalgamation of these disciplines can be simply referred to as Mechatronics. Mechatronics is much broader than robotics. In fact, many modern amenities are underpinned by advancements in mechatronics. The word “mechatronics” was first coined by Tetsuro Mori, a Japanese engineer, in 1969. Tetsuro used the word mechactroncis to combine the disciplines of mechanical and electronic engineering to describe the electronically advanced control systems that Yaskawa was building for mechanical factory equipment. Devices containing mechatronics can be found everywhere from computer hard drives to washer machines. Anything that is considered a smart device can also be considered a mechatronic device, and essentially anything that works interactively or autonomously is a smart device. An electric clothes dryer is a perfect example of a mechatronic system. A dryer’s ability to determine how long it takes to dry a load of laundry is accomplished with sensors that pick up certain stimulus that act as feedback to a control system. Ultimately, the control system directs the machine to shut off the dryer motor and heating element at the correct time. The major difference between robotics and mechatronics is that mechatronic systems encompass an array of devices that may not appear to be robotic in nature. Other examples include the systems used to lock car doors, lower and raise car windows, and move windshield wipers. Despite executing simple tasks, the design of these systems can be complex and are what makes the modern automobile modern. Microelectronic Mechanical Systems (MEMS) can be defined as miniaturized mechanical and electromechanical elements (i.e., devices and structures) that are made using microfabrication techniques. MEMS can range in size from well below one micron to several millimeters, and due to their size, they can easily be integrated into many different systems. Likewise, the types of MEMS devices can vary from relatively simple structures having no moving elements, to extremely complex electromechanical systems with multiple moving elements under the control of microelectronics. The one main criterion of MEMS is that there are at least some elements having some sort of mechanical functionality whether or not these elements can move. Some functional elements that can be found in MEMS are sensors, actuators, and microelectronics; however, the major engines of MEMS are microsensors and microactuators, which act as transducers, converting measured mechanical signals into electrical signals. MEMS sensors can be found in everything and outperform their macro scale counter parts. This increase in performance can be attributed to high precision manufacturing techniques that are similar to the batch production techniques used in the integrated circuit industry. This form of manufacturing also allows for low per-device production costs. Some of the most popular applications for MEMS sensors include temperature, pressure, inertial forces, chemical species, magnetic fields and radiation. Every sector in the manufacturing industry is trying to make their product smarter and better than their competition. The smartificaiton of products is synonymous with the integration of sensors into products; nevertheless these sensors need to be small in order to meet consumer’s demand for highly sophisticated but nonintrusive products. With these specifications, MEMS sensors are becoming a viable solution to enhance the functionality of products. When discussing mechatronic systems, it is the tangible mechanical and electronic aspects that receive all of the attention when in reality it is the code behind the machine that makes the system truly useful. The technical labor hours spent programming electromechanical machines can be a major source of eligible expenses for the R&D tax credit. This is because by nature, programming is highly experimental. After an algorithm has been developed, it is run through a compiler and in most cases there is an error that needs to be resolved. The programmer must then begin the process of troubleshooting which entails the consideration of different solutions to resolve the issue. Even when the code is successfully complied, inputs need to be tested further to determine the most accurate and desirable readouts. Similarly, testing mechatronic systems regularly consists of functionally tests. After tests are performed, algorithms are edited to make the system more efficient. Testing might also reveal the need for an additional sensor in order to effectively gauge the environment and provide more data to the system. Additionally, the development of new patches and other software upgrades are also an excellent way to improve the performance of a machine without altering the physical design. Embedded systems play a major role within electromechanical systems. An embedded system is a combination of computer hardware and software that is designed for a specific function. Embedded systems can be found in anything from toys to cars. The embedded system market is expected to be larger than $20 billion by 2020, driven significantly by the Internet of Things. Because many of the smart components associated with the Internet of Things are essentially mechatronic, these concepts complement each other. Embedded systems rely on integrated circuits found in microprocessors and microcontrollers to execute their tasks. More and more people are beginning to develop sophisticated products at low cost due to declining prices on capable microcontroller platforms such as Arduino and Raspberry Pie. These platforms are behind many of the innovative products found on Kickstater and other crowdfunding websites. Electronics and systems based on mechatronics are the leading drivers of innovation in the automotive industry. From digitally controlled combustion engines to anti-lock brake systems, cars entail complex mechatronics systems. Anti-lock brake systems (ABS) enable vehicles to maintain traction while breaking. The primary objective of ABS systems is to prevent the vehicle’s wheels from locking up while breaking, which can cause skidding and subsequent loss of control. Now, ABS systems are being further enhanced by mechatonic systems to further improve breaking control. Specialty sensors that determine angles and gyroscopes are being used to measure steering wheel angle and the direction in which the vehicle is faced. When the angle of the wheel does not coincide with the direction of the vehicle, the control system will activate the breaks on the necessary wheels so that the vehicle will continue in the direction that it is being steered. As automotives become increasingly sophisticated, so will the mechatronic systems that control them. Developments in mechatronic systems are fundamental to the success of advanced driver assist technologies such as self-driving and self-parking cars, as well as collision-avoidance systems. Although mechatronic systems are the leading force of innovation in the automotive industry, they are also a major source of failure due to their complexity. Therefore, it is imperative to test the mechanical performance of sensors. The process of testing components of mechatronic systems can be challenging because of their complex geometries and size constraints. Companies that specialize in the design, manufacturing, and testing of mechatronic components and systems are engaged eligible activities and should apply for the R&D Tax Credit. With improved technologies, many manufacturers are making use of collaborative robots. Despite the ability to increase efficiency using high performance collaborative robots, the process of integrating them into the factory environment is rather complicated. 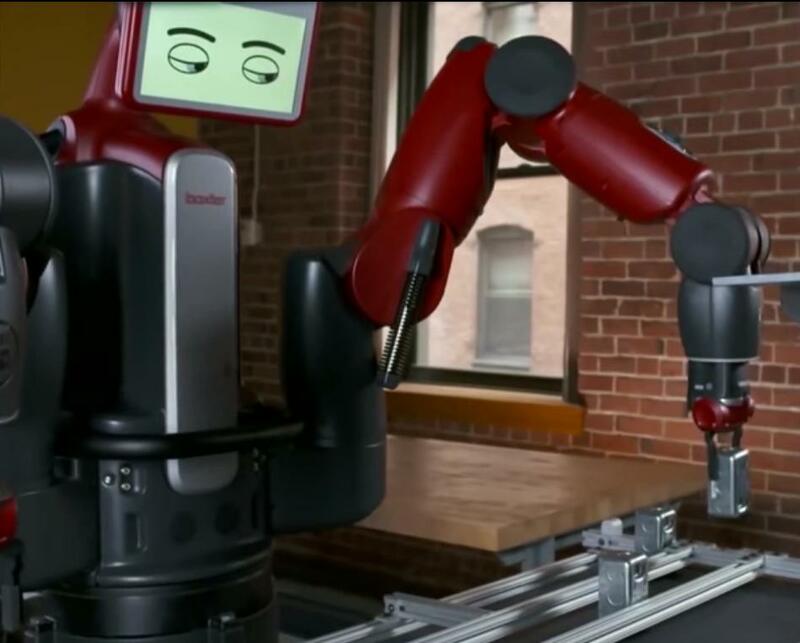 Some collaborative robots, such as the Sawyer and Baxter robots developed by Universal Robotics, are easily programmable by simply guiding the robot’s arm. However, the biggest issue many factories face is not the programming of the robots themselves, but how necessary materials are delivered to them. This is why mechatronic devices are crucial for the integration of collaborative robots and other industrial automation robots. Mechatronics engineers can analyze the capabilities and limitations of a collaborative robot and determine what needs to occur in order to accomplish a specified task. Usually the solution will require the development of electromechanical machines that use sensors to determine the location of materials or products and deliver them to the robot. For example, a factory owner wants to automate the packaging of a product. Normally an operator would remove the product from a machine after each cycle and place it on a manual roller conveyor system where another worker subsequently packages the product. In order to successfully automate this production process by integrating a collaborative robot, there exists a need to be able to move the product from the machine and down the line. A solution to the problem might be to invest in a prefabricated factory robot on the market that could retrieve the product, such as KUKA arms. Or, if the removal and transport of the product is not that complicated, the task might be better accomplished by the development of a relatively simple custom mechatronic machine. Another instance where mechatronics can play an important role in the integration of collaborative robots is the manipulation of products in a way that the robot can reliably handle a material. Consider a disk- shaped product with many holes in it. Such a product is not easily manipulated by mechanical or pneumatic means. Developing a device that features mechatronic systems to enable the flipping and stacking of a disk-shaped product would allow a collaborative robot to use a simple claw attachment to pick up the disks from the sides. In the years to come factories across the United States will increase their automation efforts in order to remain competitive. Any company integrating automation equipment into their manufacturing processes are engaged in R&D eligible activities. Mechatronics is drastically changing the landscape of the medical sector. With more intelligent innovations being made regularly, doctors and medical professionals are able to work with stronger and more reliable medical equipment. Almost all medical instruments involve some sort of mechanical interface that interacts with the patient. Sensors interpret mechanical feedback which then produces data that can be cleaned and manipulated using computer algorithms until the data is refined enough to be useful to the operator. 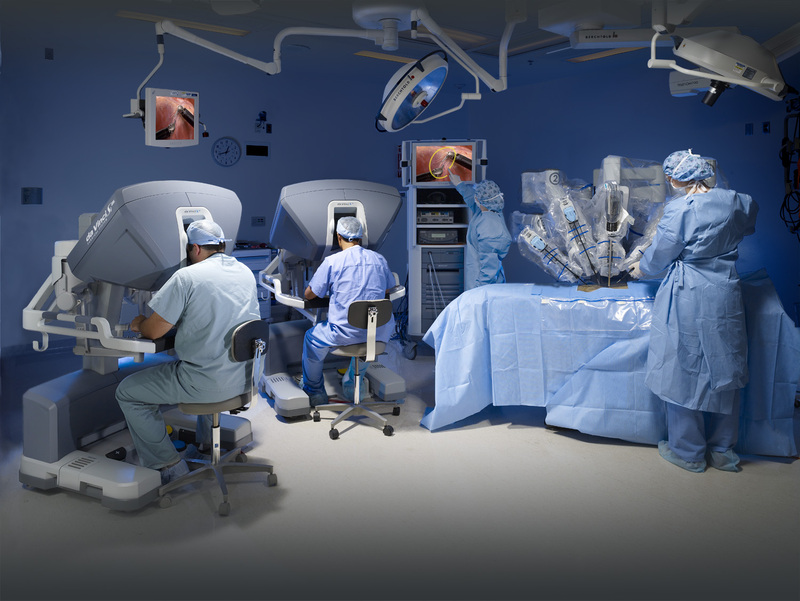 Machines like the da Vinci Surgical System; an assisted robotic surgery device, produced by Intuitive Surgical, enables doctors to perform complex surgeries from a remote location. The eletromechanical elements of the system work in perfect harmony with a series of sensors to give the operator complete control of the robot’s arms and features optics that enable up to 25-micron resolution, which allows surgeons to have greater control during procedures than ever before. With the advent of the da Vinci Surgical System, remote surgery is now possible. This means that one day the best doctors in the world might have the ability to conduct several surgeries all over the world in one day. Some of the most significantly life changing technologies in the medical industry are coming from the prosthetics sector. Mechatronic control systems are giving prosthetics functionality that has never been seen before. Mechanical and electrical elements coupled with advanced sensors are enabling prosthetics to become smart devices. In modern prosthetics, myoeletric sensors pick up muscle contractions. The data picked up from these sensors is then amplified and processed digitally before being translated into motor command. 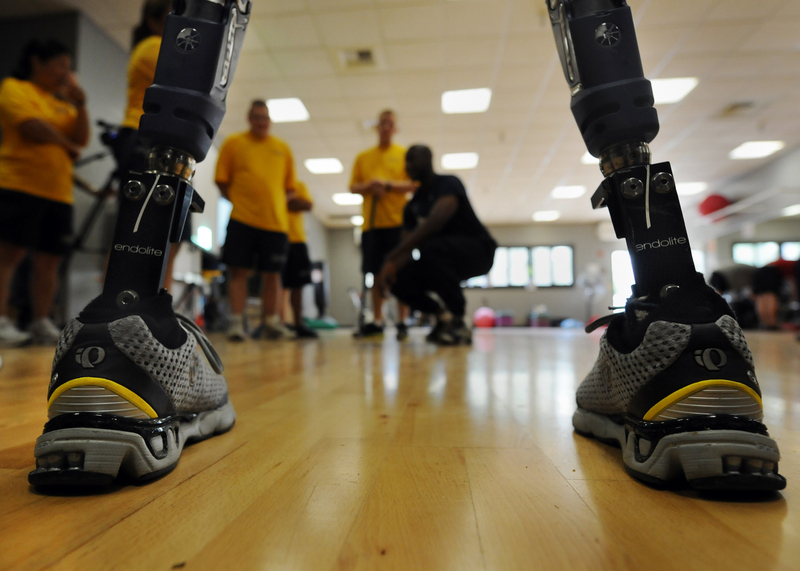 Modern prosthetics are designed with high precision DC motors that transmit torque to transmission gearheads, resulting in linear force that is stored in a compressed spring. The force in the spring can then be released in calculated movements when directed by the control system. Electromechancial devices provide enhanced gait compared to prosthetics that operate using only using mechanics. Enhanced gait capabilities stem from numerous three-axis accelerometers and multiple microprocessors, which calculate the angle between the foot and ground. The demand for biomechatronic devices are at an all-time high and show no signs of slowing down. With increasing technological advancements in recent years, biomechatronic researchers have been able to construct prosthetic limbs that are capable of replicating the functionality of human appendages as well as help further research towards understanding human functions. However, despite this demand, biomechatronic technologies struggle within the healthcare market due to high costs and and lagging insurance reimbursement procedures. Additionally, biomechatronic devices still face mechanical obstructions, suffering from inadequate battery power, consistent mechanical reliability, and neural connections between prosthetics and the human body. Mechatronic systems currently, and will continue to, play a key role in modern technologies. Companies that engage in the development or improvement of any product that contains mechanical and electrical systems can expect to be eligible for R&D Tax Credits.